The plot in short: Harold Fry is a recently retired salesman, living with a wife long ago turned bitter, sleeping in separate bedrooms in their immaculate little house with their uninterrupted routines. Together they have a son, with whom they haven’t spoken in many long years, the blame for the estrangement put squarely on Harold’s shoulders by his grief-stricken wife. 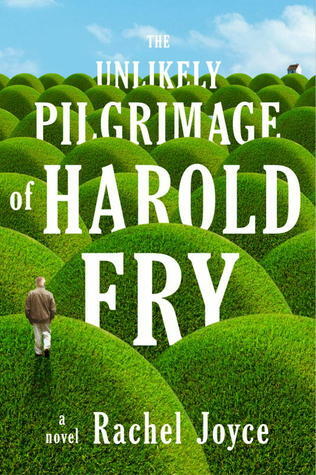 One day, out of the blue, a letter arrives for Harold: a huge event for a man of routine, to whom nothing ever happens. It’s from Queenie Massey, a former co-worker who accompanied Harold on his sales calls once upon a time, a co-worker who became a trusted friend. She has cancer, she tells him, and is dying – her short note her goodbye. Harold feels tears pricking the backs of his eyes as he realizes he’s hardly thought of Queenie in ages, that a friend who once did him a great service had been relegated to the past, forgotten. And now she is dying, essentially alone, in faraway Berwick-upon-Tweed. He writes a short note, a cursory expression of sympathy, before heading to drop it in the postbox at the end of his block. But once he reaches the postbox he decides he may as well go to the next one, which has an earlier pickup. Before he knows why, he opens the note, writing he’s coming to her, walking to Berwick from far away Devon, and she must hold on until he gets there. With no more preparation than that, he’s off on his adventure, not dressed for walking, without so much as a cell phone. His journey is Quixotic: by turns exciting and mind-expanding, exhausting and frightening. But he soon finds his pace, meeting strangers whose stories help put his life in perspective. Meanwhile, back home, his wife Maureen waits, getting the occasional phone call to let her know he’s alright. While he’s away she has the chance to mull their life together, the relationship that started out so promising and turned out so very horrible. Does she love him? Does he love her? Or is it Queenie who’s the love of his life? You will love Harold and – unless your nature is completely unforgiving – grow to at least understand Maureen. The book – the writing, the characterization, the plot – is breathtaking. Gorgeous.